by Betsy: Ghosts of tangles past. This week's Diva challenge is interesting! She invited us to recreate a tile from the past in our current style. I found Zentangle in the latter months of 2010. So this tile would have been one of my earliest ones. I was pretty proud of it as it graced the cover of my hand made art journal and I had incorporated die cuts into the string! That equated to awesome, right? Here are some things I noticed about that early tile. First, the paper. 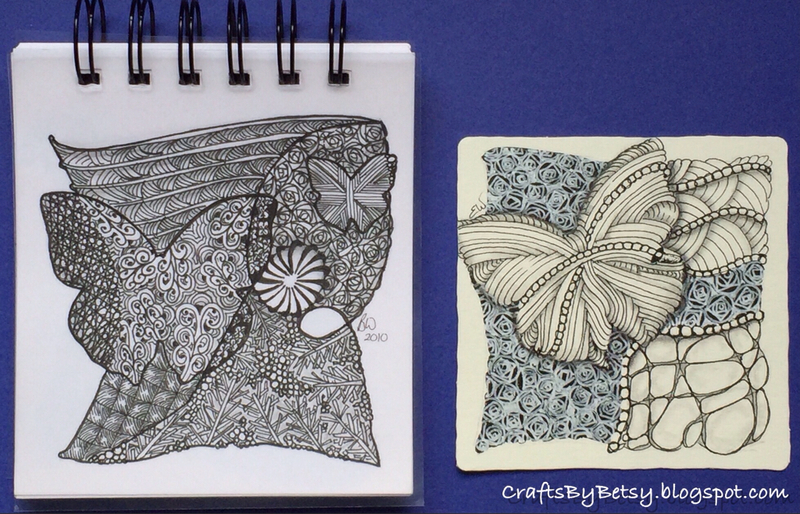 I wasn't using the Zentangle® tiles back then. I was hoarding them and using cheaper paper instead. Also, as a rubber stamper, I was more comfortable with smooth paper. And wow, look at those tiny tangles! I think there are 9 different patterns in there! I also noticed that I felt the need to have a "hard boarder", that thickened line to signify this is the edge of my drawing! All of my tangles sit nicely in their respective places, but they don't intermingle at all. And, no contrast! What little contrast is there, was totally by accident and not exactly balanced. So in recreating the tile, I found one of the die cuts (I felt one was plenty) and I used some of the same tangles, but cut the number down significantly. Those that stayed were encouraged to play nicely together. And one section I filled in with black ink before tangling again with a white Gelly roll just for some contrast. It'll be interesting to try this again in a while and see what happens next! I really like the contrast in these two....it shows how far you have come in your confidence to tangle. At least it does to me. I love the way that you have loosened up the tangles and relaxed them, it seems more "zen" to me. Nice job! A huge difference and growth! Great lessons! Contrast, less-is-more, bigger-is-better and tangles-playing-well-together! I'll try to remember these! Well, I think you have done an honest and thorough comparison pointing out your improvements and why all by yourself! Good job!